Photography is very much a hobby of mine these days. I never really took it seriously until I returned to the UK in 2007 after a 14 year holiday in Spain. 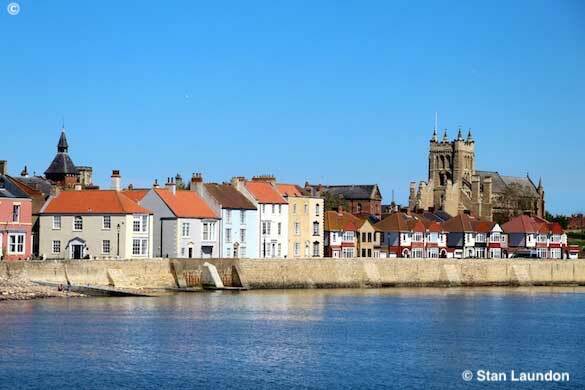 As the page title suggests it is not just photographs of Hartlepool featured here but in and around the north east in general. 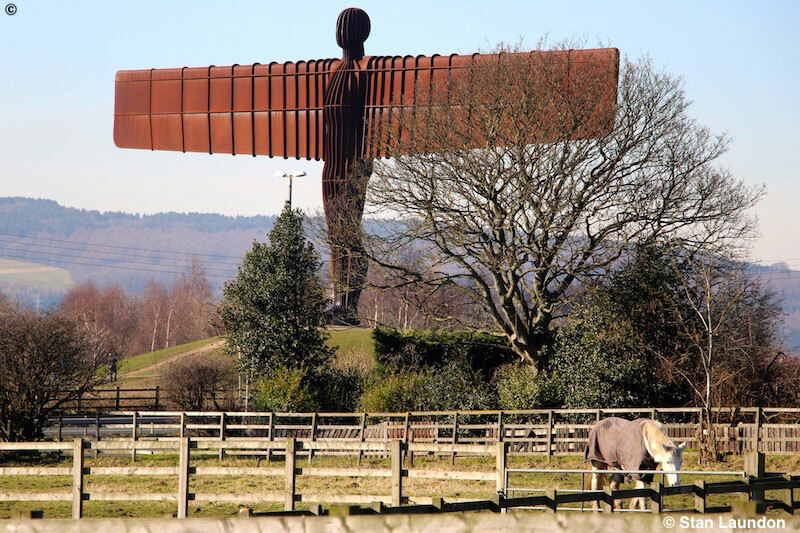 Antony Gormley’s Angel of the North, which was built in Hartlepool, celebrated its 21st birthday on Friday, February 15th and I took the opportunity to visit the site in Gateshead and later and enjoyed a lovely meal in the Angel View Inn. 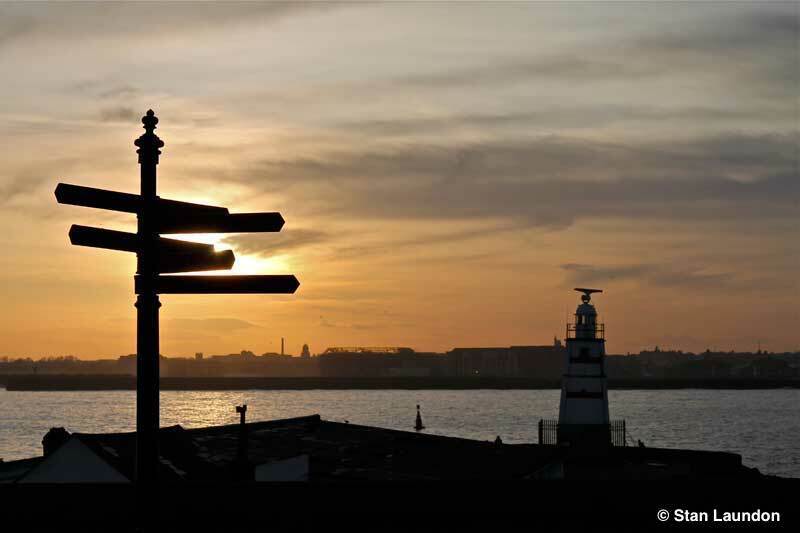 The Pilot's Pier in Hartlepool, with a view across the Tees Bay to the industry on Teesside, taken during early February 2019. 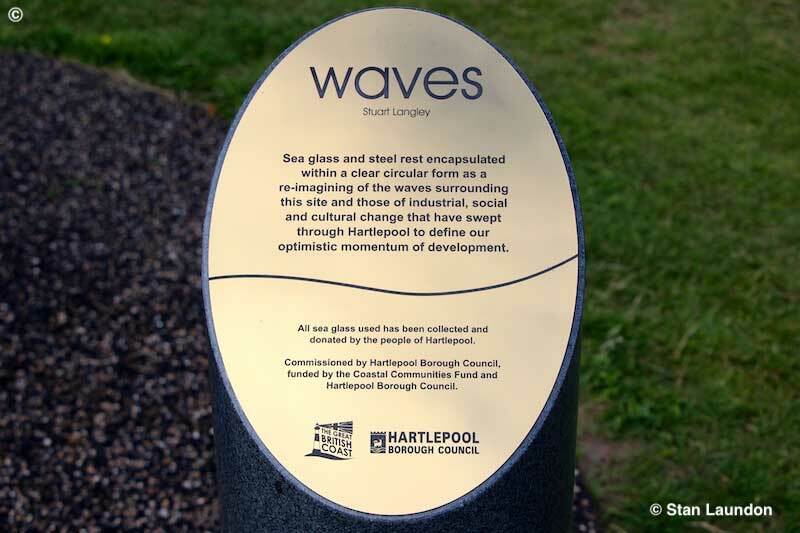 Waves, by Stuart Langley, can be seen on the sea front at Seaton Carew. A plaque explaining more about this monument can be seen in the right hand column. 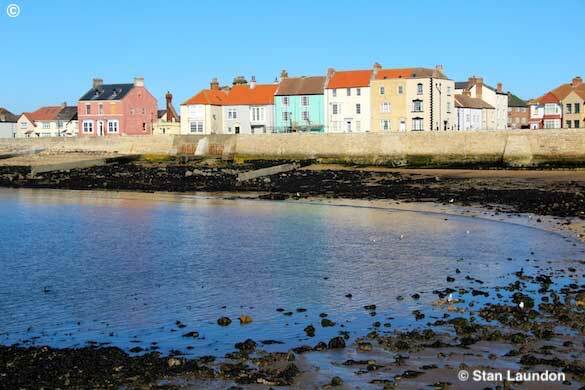 A low tide on the Fish Sands with the picturesque and colourful houses on the Town Wall and how nice it was to see this photograph used on "BBC Look North" evening weather, with Jennifer Bartram, on September 28th, 2018. St. Hilda's Church taken from the car park in Middlegate on a sunny late January afternoon just before half past three as indicated on the clock! Not a pretty sight to see as I drove through Greatham during late September, 2018. 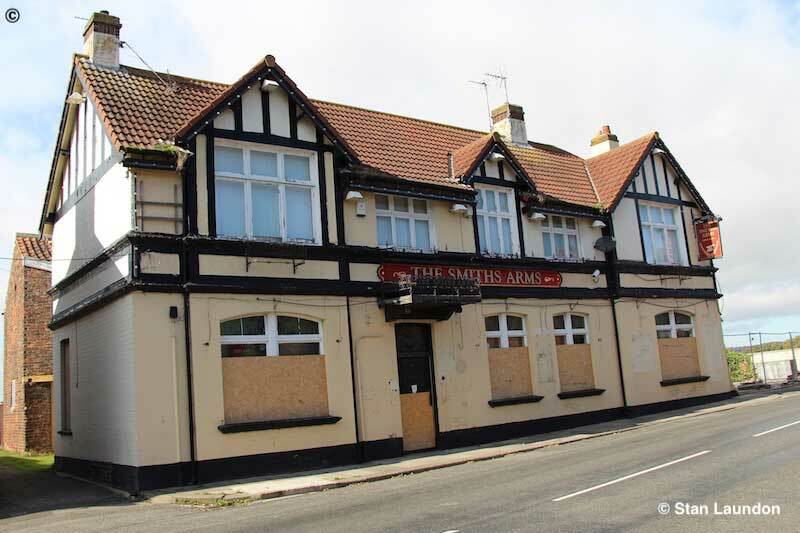 The Smiths Arms public house is in a sorry state. I'm told, on good authority, that it is being turned into apartments. This was quite an impressive site as the offshore supply vessel "Aethra" from Cyrprus sailed down the channel and about to leave port. 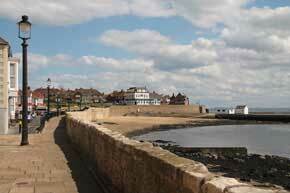 You can just see the houses on the Town Wall to the right hand side. The Boy on a Bicycle sculpture, by Bob Hollywood, is close to the railway station and celebrates the film directors' Sir Ridley and Tony Scott and their links to Hartlepool. They both studied at West Hartlepool College of Art. 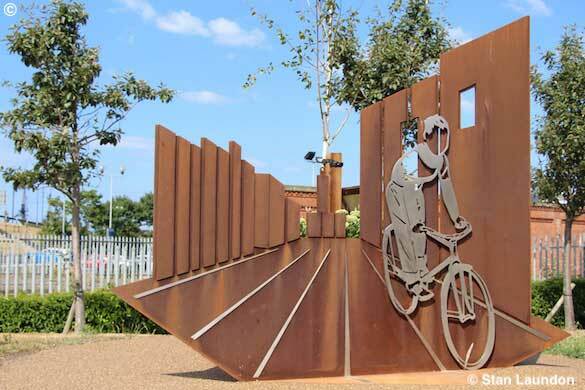 The “Boy and Bicycle” recalls Sir Ridley Scott’s black and white film from 1965 which he shot in town and you can see on the British Film Institute website. 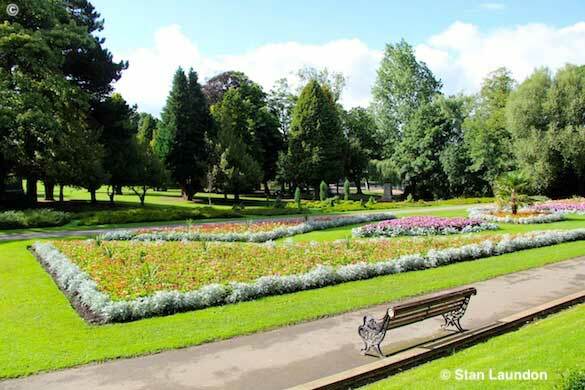 Ward Jackson Park with the flowers in bloom taken during late August, 2018 and congratulations to the parks' department and gardeners for a magnificent job they do! 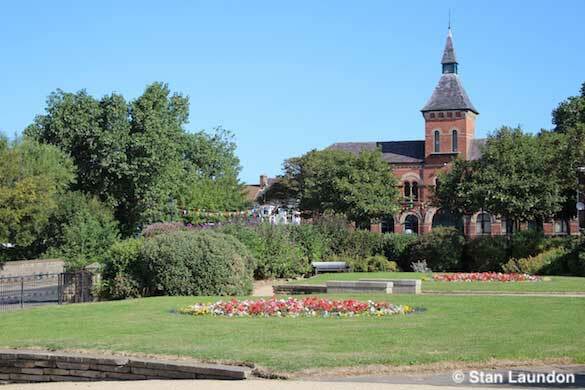 Beautiful flowers in Croft Gardens in the early morning sunshine on Thursday, August 9th, 2018 with the Borough Hall as a backdrop. York Minster - or to give it its correct and full name it is The Cathedral and Metropolitical Church of Saint Peter, York Minster - and is a Grade I listed building. 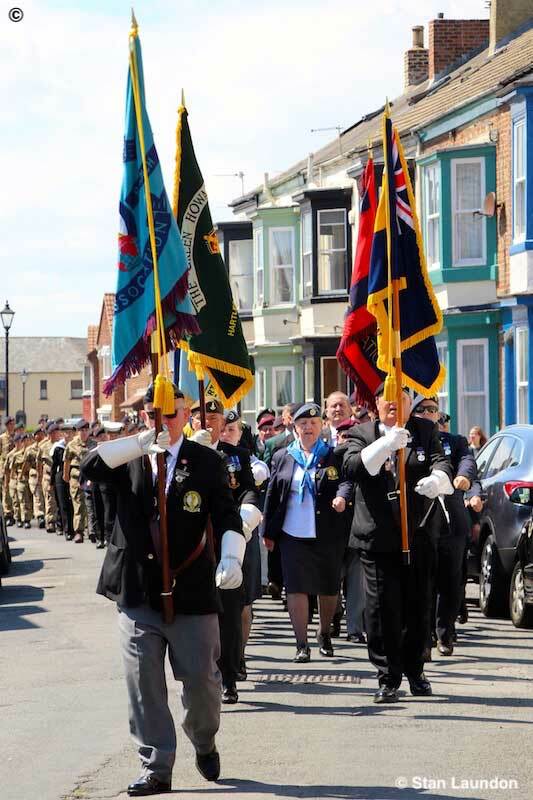 Old Hartlepool was the venue on Saturday, July 7th, 2018 for Hartlepool Armed Forces Day and The Headland Heritage Festival which was organised by Hartlepool Armed Forces Liaison Group and Hartlepool Headland Local History Group. 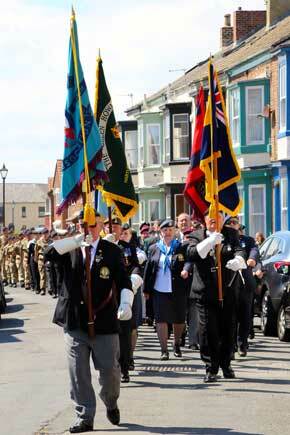 Hundreds of people turned out for the event on a glorious sunny afternoon. When I was out on Friday, July 6th, 2018, waiting for the offshore supply vessel “NORMAND FLOWER” to leave port I spotted the fishing boat “SEA BREEZE” (HL7) sailing in. Get them both together I thought - little and large! The A3 "60103 "Flying Scotsman" hauling "The Cathedrals Express" from York to Edinburgh on Saturday, May 19th, 2018. She is seen here at Tursdale Junction, just north of Ferryhill, in County Durham. She was initially scheduled to stop at Tursdale for about thirty minutes but, as she was running an hour late, she sped through at speed. 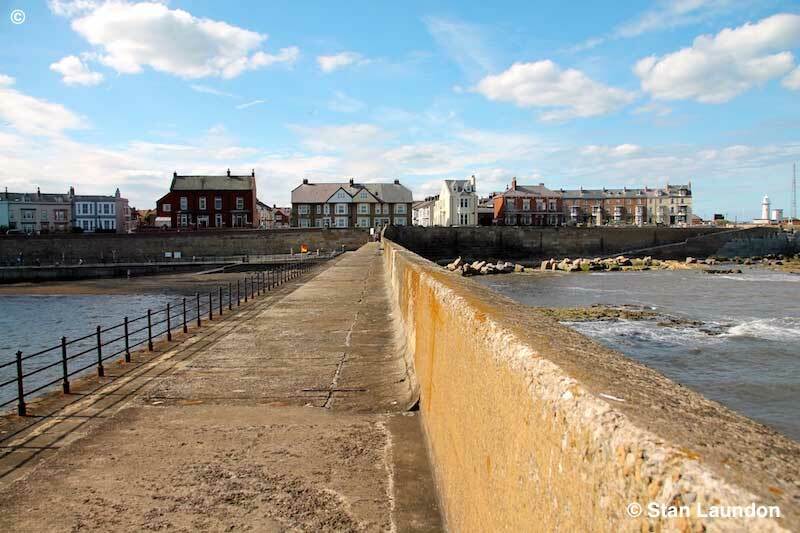 A nice sunny view of the Town Wall in old Hartlepool taken from the Banjo Pier in Middleton on Monday, May 14th, 2018 and used on Tyne Tees Television weather. 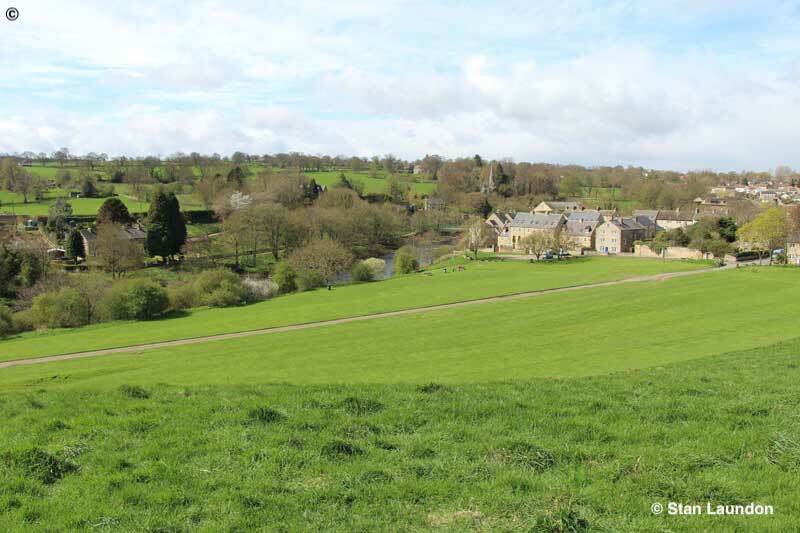 This picturesque view of Barnard Castle, overlooking the River Tees, was taken during late April 2018 and was also used on BBC Look North Weather - and how nice to see! 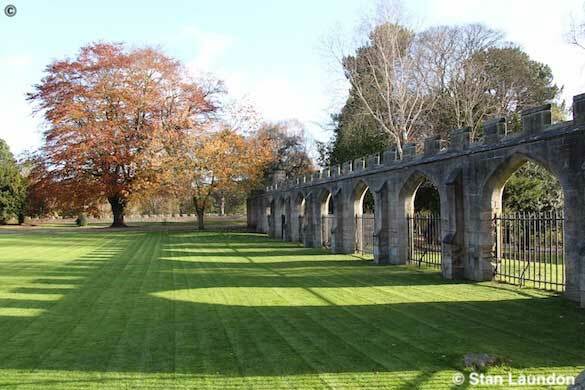 A nice Autumn view of the gardens and grounds in Auckland Castle. 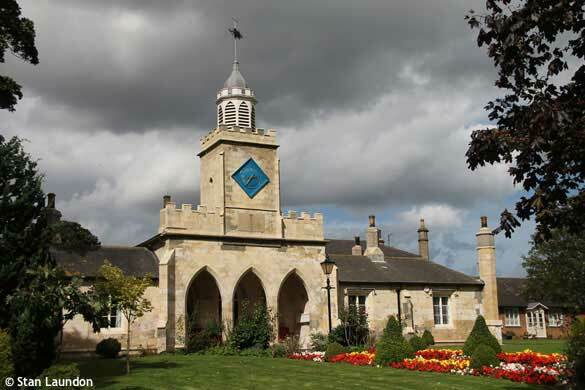 The Castle, in Bishop Auckland, County Durham, is Grade II listed. 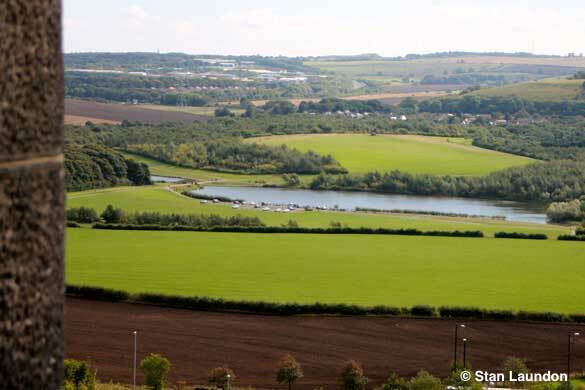 Herrington Country Park near Penshaw, Tyne & Wear. This was taken from inside Penshaw Monument. 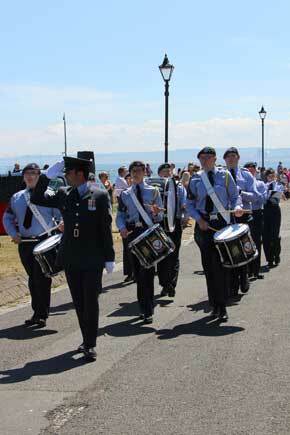 You can just see a column to the left hand side of the photograph which was purposely left in! 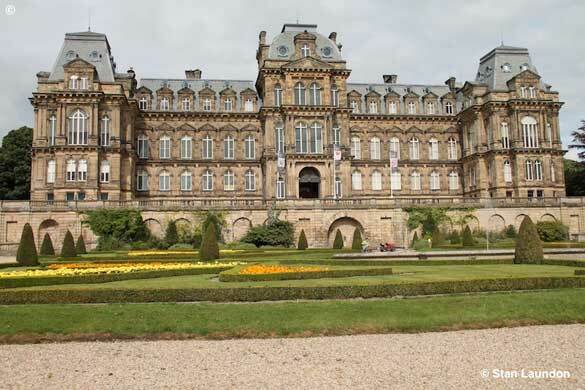 It had been on my mind for quite sometime to make the journey through to Barnard Castle to take some photographs of the spectacular Bowes Museum - well I managed it during late August 2017. The museum is a hidden treasure and a jewel in the heart of beautiful Teesdale. 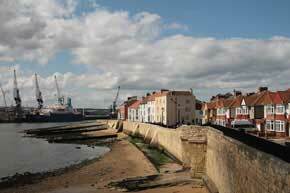 A busy scene in Hartlepool Marina on an overcast afternoon with the many yachts, fishing boats and cruisers at berth. 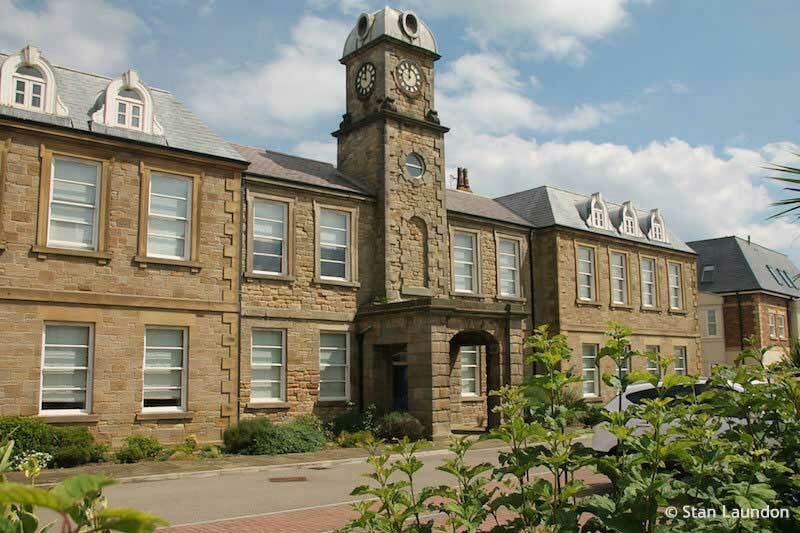 This very impressive Grade II listed building is Beddell House care home at Sherburn Hill in the parish of Shincliffe, County Durham. 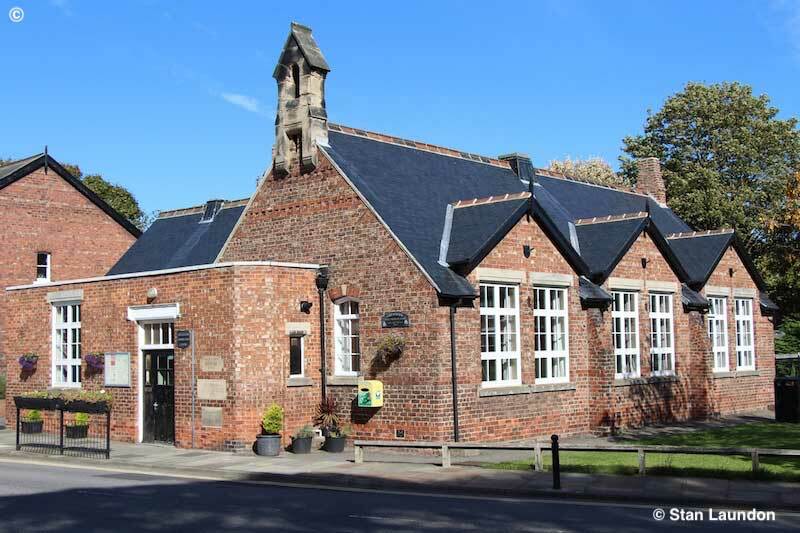 It was built around 1868 and more photographs of this building can be seen on the Historic England website. 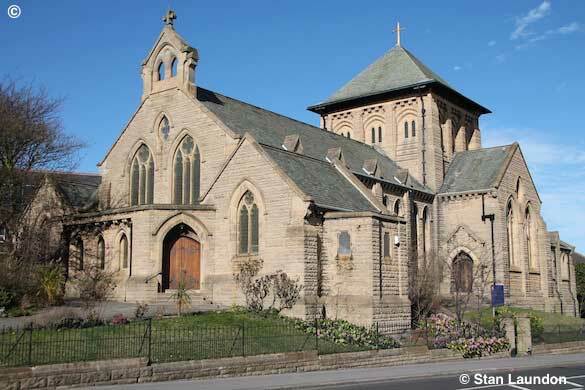 When I made a trip to Horden I couldn't help noticing the impressive St. Mary's Church on Blackhills Road and decided to stop and take a few photographs. 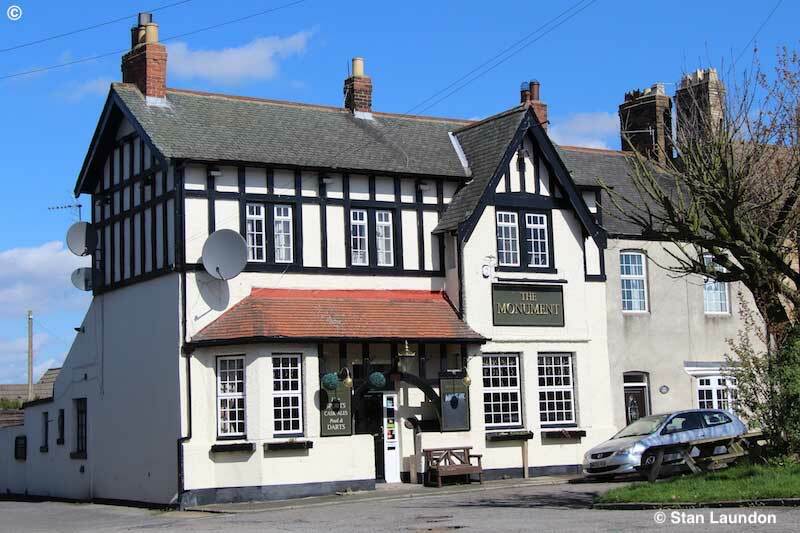 It is Grade II listed and you can read more about it on the Historic England website. 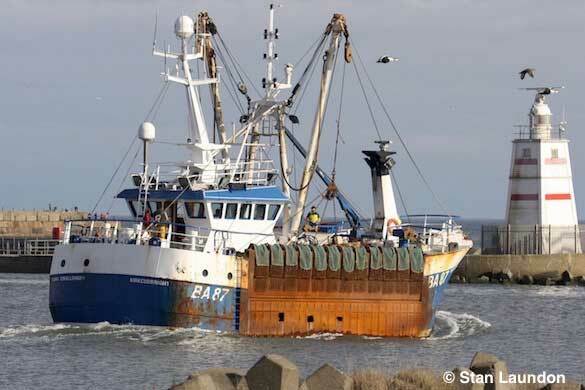 The Scottish beam trawler "King Challenger" (BA 87) sailing down the channel leaving Hartlepool. She is registered at Ballantrae and from Kirkcudbright. A rare sight indeed. 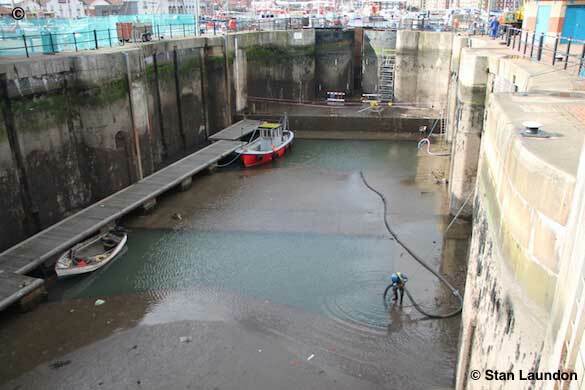 The lock gates in Hartlepool Marina had been closed for essential maintenance during February 2017 which took about 17 days to complete. It had been more than 20 years since this type of work had been carried out and the cost was estimated to be around £80,000. 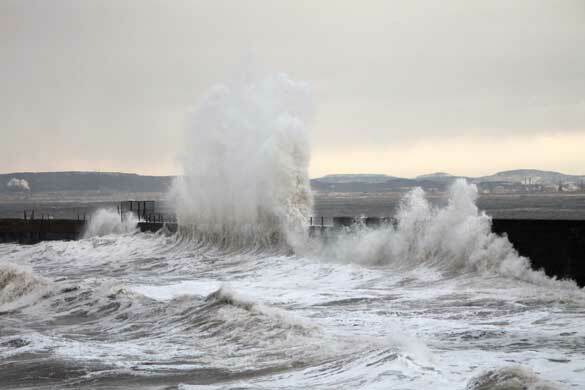 High winds and stormy seas certainly bring the photographers out in force and, as always, the New Pier - Heugh Breakwater - in old Hartlepool is a good place to be if you keep a safe distance! The cold spell we had recently made you to wrap up and keep warm. Someone obviously thought the same for poor old Andy Capp, in Croft Terrace, on the seafront in old Hartlepool, by providing him with a suitable scarf! 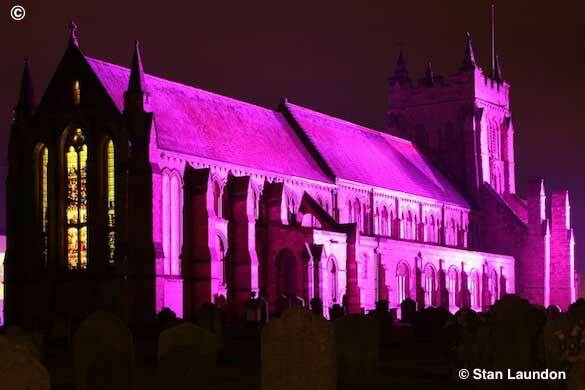 St. Hilda's Church is lit up in various colours as part of the annual Wintertide Festival which takes place for three days each November. Other images from the festival can be seen on my Night Photography page. 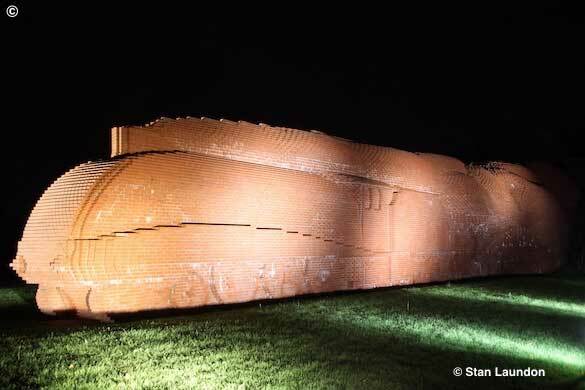 This wonderful sculpture of a brick train can be seen just off the A66 near Darlington. 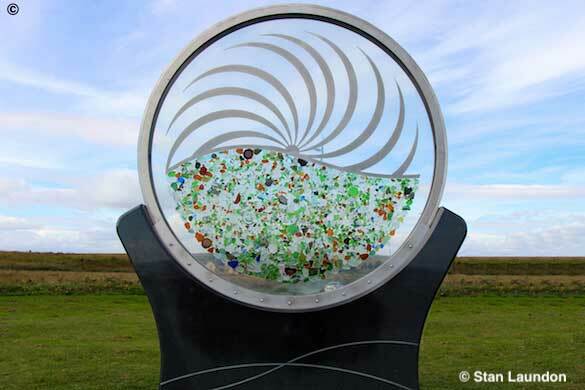 It was was commissioned and created by David Mach in 1997. The train is based on "Mallard" the Sir Nigel Gresley designed A4 pacific locomotive and was constructed using 185,000 bricks. 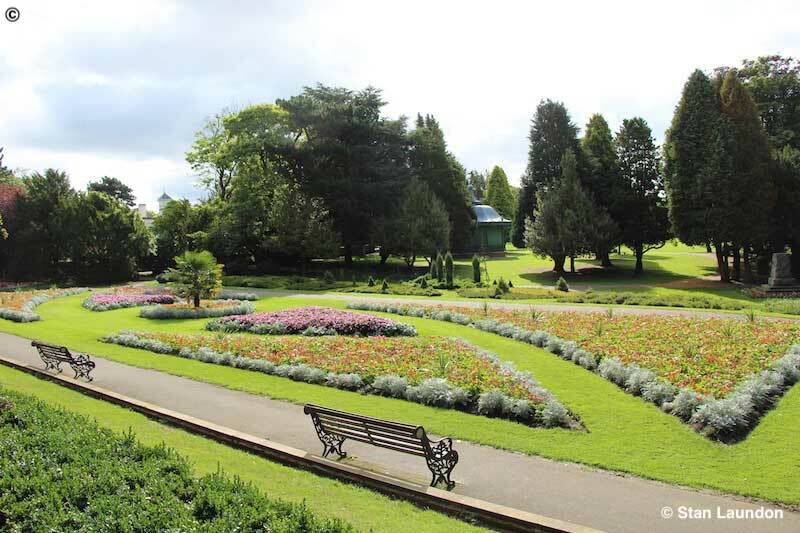 Funding was provided by the National Lottery, Morrisons Supermarkets, Northern Arts, The Department of National Heritage and Darlington Borough Council. For those of you wanting to see it, it is quite close to Morton Park Industrial Estate on the outskirts of Darlington. During another spell with night photography in September 2016 I took a friend, from Washington in Tyne & Wear, to certain sites in town that he might enjoy seeing. Jackson's Wharf public house and restaurant was one of the many places we visited - to take pictures not to eat and drink! I'm sure many people in Hartlepool will have seen this plane in the grounds of the College of Further Education in Stockton Street. 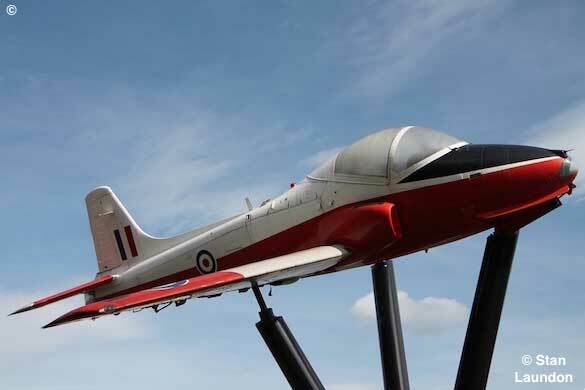 It is an ex-RAF Jet Provost T5 XW405, which arrived in town from storage on June 20th, 2012 and, over several months, was fully stripped, repainted and rebuilt by students and staff to restore it to this excellent external display condition. Photograph © copyright Stan Laundon. 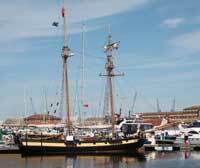 "HMS Trincomalee" which is berthed at The National Museum of the Royal Navy in Hartlepool. 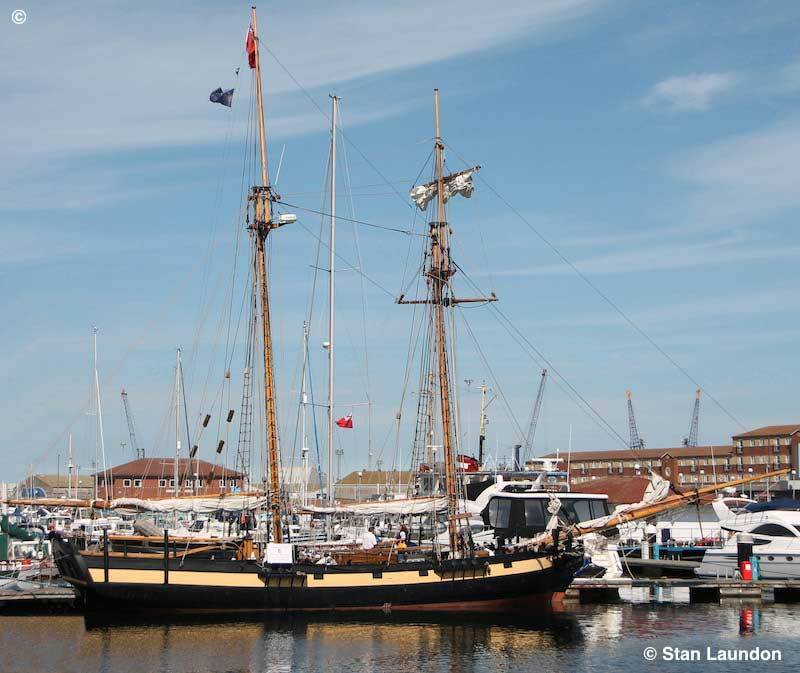 She is the oldest British warship still afloat. With its towering structure and thundering cannons, is a perfect tribute to Hartlepool's seafaring tradition. 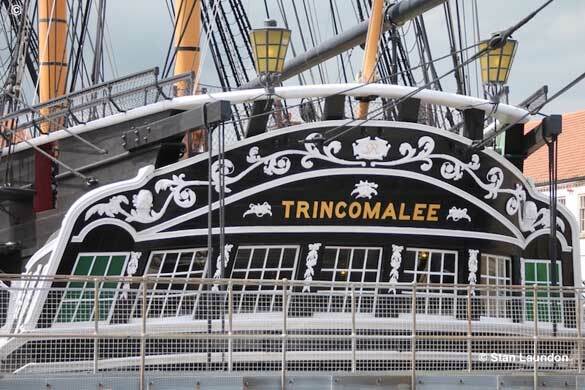 Built in Bombay, India in 1817, the Trincomalee was brought to Hartlepool in 1987, where it has taken over 10 years to restore the ship to her former glory. The A3 60103 "Flying Scotsman" hauling "The Tynesider" excursion through Ferryhill on June 11th, 2016. You can see more photos of this classic engine on my "Flying Scotsman" page. I couldn't resist taking this photograph of a male Eider Duck as it stood on a groyne near the Town Wall as the tide came in. You can read more about this species on the RSPB website and also see it in a slightly larger size by clicking on the image. The Morison Hall was once a grand old building that was used by the Boys' Brigade for their meetings and band practice and also for functions and socials. 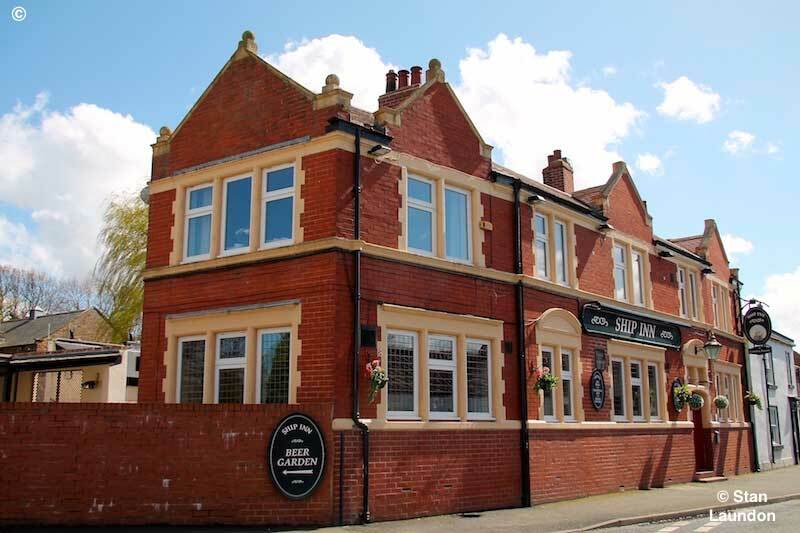 As you see it now, with this photograph taken during mid-April 2016, and after the local council approved planning application, it has been turned into luxury flats. The Morison Hall was actually built as a Methodist Church. It became a Boy's Brigade hall when they took the building over which gave its name from their founder Dr. Bertie Morison. There's more about the building on our Old Hartlepool page. When I was on the fish quay to take a few photographs of various vessels, this seal caught my attention as I stood on the quayside. The ships just had to wait as I took some photographs of this lovely creature before she dived out of sight. You can view it in a slightly larger size by clicking on the image. The Cosmopolitan Hotel on the corner of Middlegate and Durham Street in Hartlepool. Two scenic views of the ancient Town Wall in old Hartlepool as seen in an episode of the BBC Television drama series of "George Gently". Click on the images to view them in a larger size. 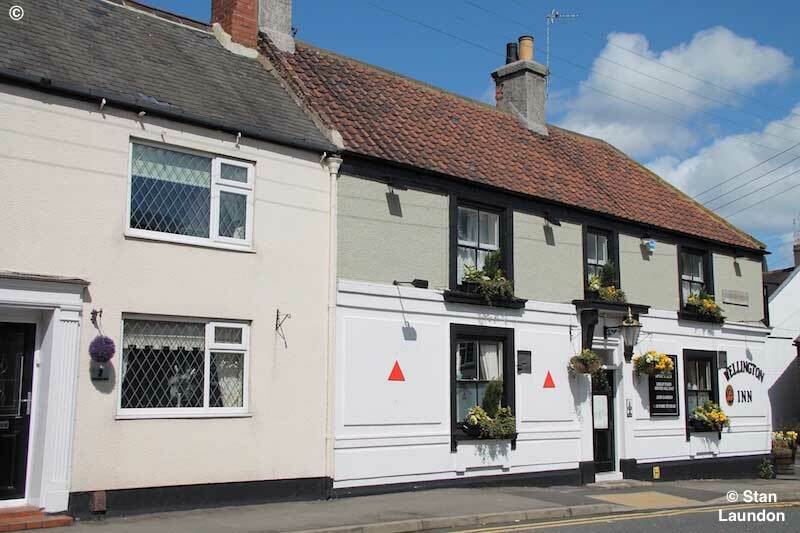 Two public houses just on the outskirts of Hartlepool - The Ship Inn and The Wellington Inn both in the village of Wolviston. 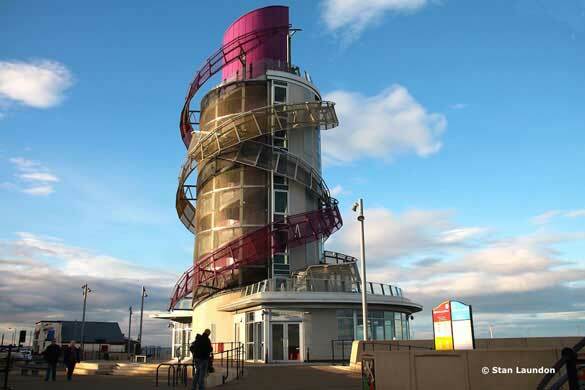 Redcar Beacon, also known as the vertical pier, is the town's tallest structure at 80ft (24m) high and has seven floors. There are 132 steps and a lift. There is cafe and open roof terrace which have 360 degree views. Admission is free. The beacon was opened to the public during March 2013. The tower, which cost £1.6m did attract criticism from some residents who had favoured a horizontal, rather than a vertical, pier. 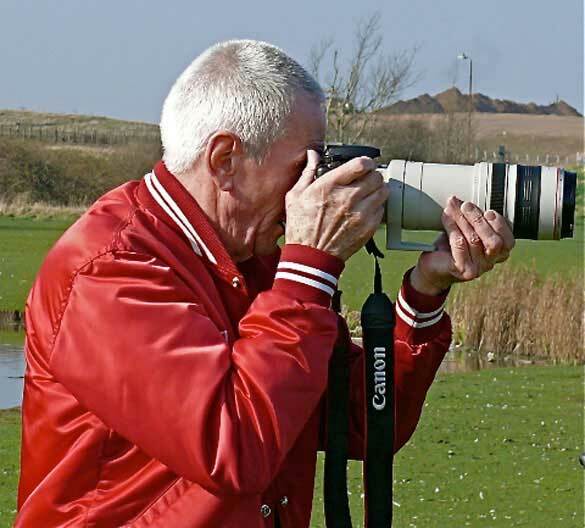 The Hospital of God at Greatham, on the outskirts of Hartlepool, certainly attracts a lot of photographers. 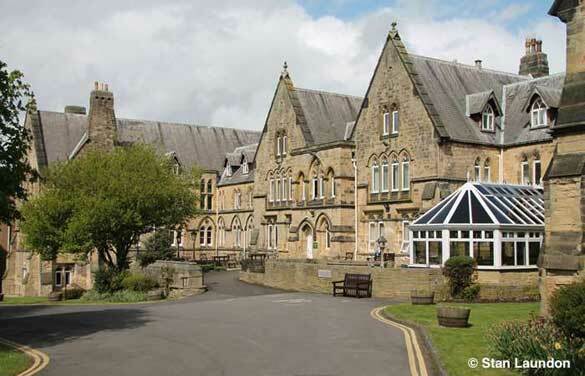 It is a Grade II listed building and is used as apartments for the elderly. 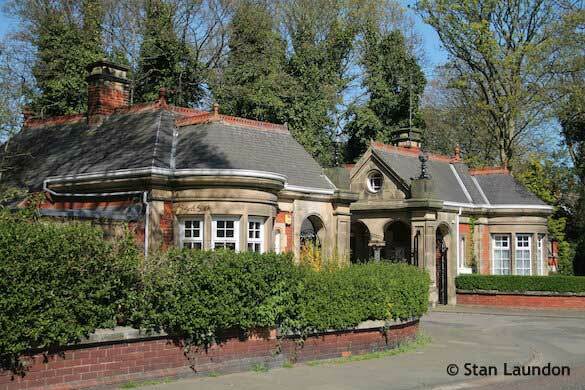 The East and West Lodges at the entrance to Tunstall Court, near Ward Jackson Park in Grange Road. The buildings are Grade II Listed and built around 1890 - possibly by T. Lewis Banks, of London, according to the Historic England website. Both lodges are now private dwellings. I do hope you enjoy seeing this slideshow of the Infinity Bridge which spans the River Tees in Stockton, England. The bridge, which is very picturesque at night, is a major part of the North Shore Development in Stockton. This iconic structure, named Infinity Bridge in September 2008 links the North Shore development and the Teesdale area. I first visited this location in April 2010 and have made several visits since then. Believe it or not I always find different angles to shoot. Photographs © Stan Laundon. All photographs on this page are copyright © Stan Laundon and must not be copied, or used in any way, without prior written permission. As photography is very much a hobby of mine these days I do hope you enjoy a selection of my work on this page. 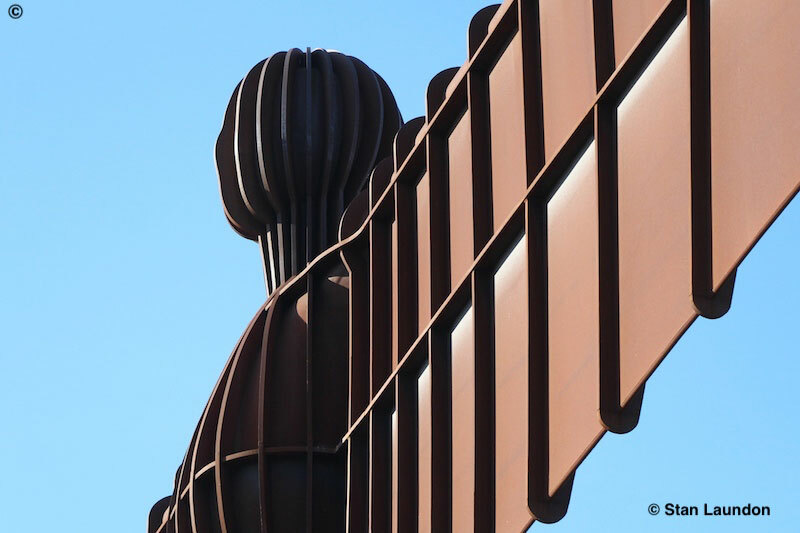 An upper view of The Angel of the North. Every time a drilling rig is constructed by Heerema in Hartlepool they always hang a monkey from the structure to remind people where it was built. On a visit to Greatham a gentleman pointed out to me this tree growing horizontally. He said that adults tell children it is where the fairies sit at night! 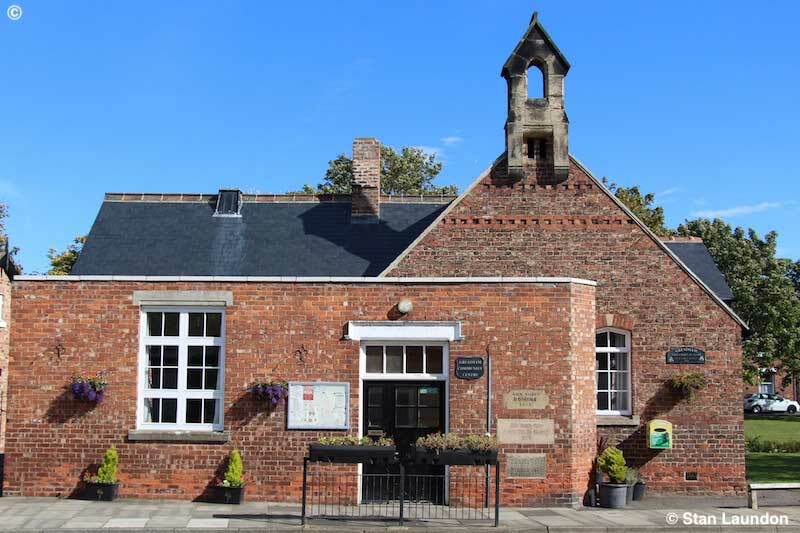 The Community Centre in Greatham is looking as good as ever as the sunshine came out during late September, 2018. Flowers in Ward Jackson Park during August 2018. The A4 Pacific (4-6-2) 60009 "Union of South Africa" heading north on an excursion at Tursdale Junction in County Durham on September 15th, 2018. Just one of the many attractions that was on the Town Moor as part of Hartlepool Carnival 2018. The Bomber took passengers high into the air and at speed - not for me thank you! This is certainly a nice setting. 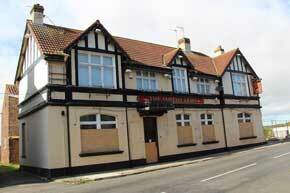 It's The Monument public house in Penshaw, Tyne & Wear. A statue of the actor and comedian Stan Laurel in Bishop Auckland. Although he was born in Ulverston in Cumbria, he did live and attend school in Bishop Auckland. 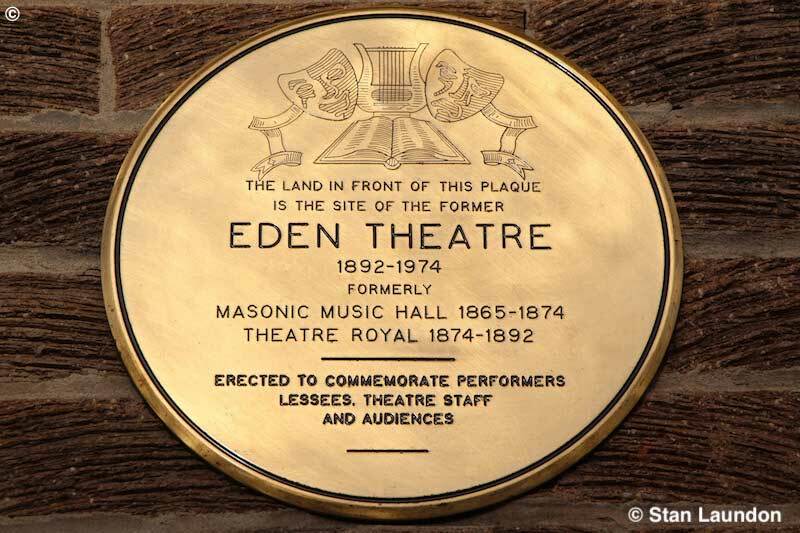 The statue of Stan Laurel is on a site of The Eden Theatre which was owned by his parents. 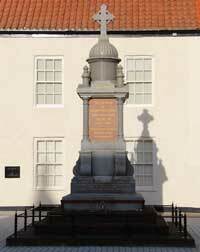 Also in Bishop Auckland this is the War Memorial in the Market Place and it is Grade II listed. I really couldn't resist this shot on a wonderful afternoon on November 2nd, 2017, as the ship "Wilson Volos" from Antigua and Barbuda in the Caribbean left Irvine's Quay in Hartlepool and was just about to pass the Pilot's Pier. A lovely sky with wonderful reflections on the sea. 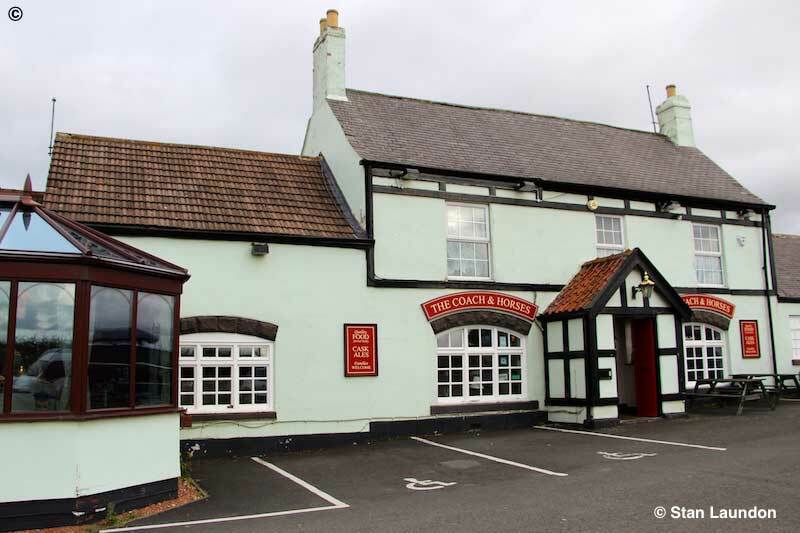 The Coach and Horses public house and restaurant at Croxdale in County Durham. I enjoyed a nice coffee here recently and must return someday to sample their food. The Dutch sailing vessel "Gallant" made a brief stop over at the Victoria Quay on Thursday, September 28th, 2017, before sailing the following morning. Penshaw Monument at Penshaw, Tyne and Wear. 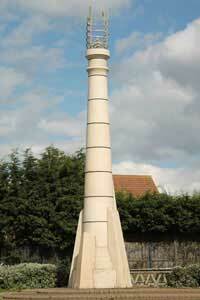 According to the Historic England website it is also known as The Earl of Durham's Monument. 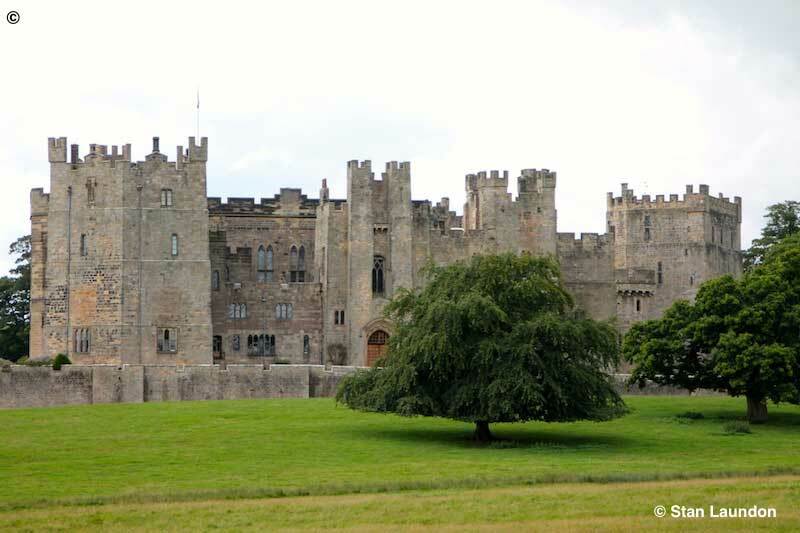 Raby Castle is in Staindrop and located on the A688 approximately 8 miles north east of Barnard Castle. 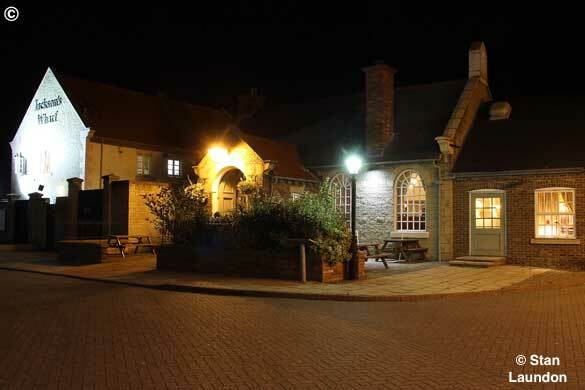 It was built by the mighty Nevills in the 14th Century and home to Lord Barnard’s family since 1626. 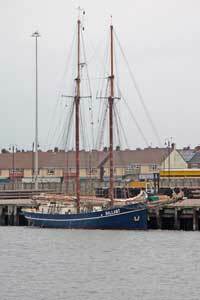 The Dutch sailing vessel "Thalassa" arriving in Hartlepool for a lay-by at the Deep Water Berth. She had sailed down during late afternoon from Blyth on Wednesday, August 30th, 2017. A Painted Lady butterfly spotted on the leaves in Croft Gardens during early October. 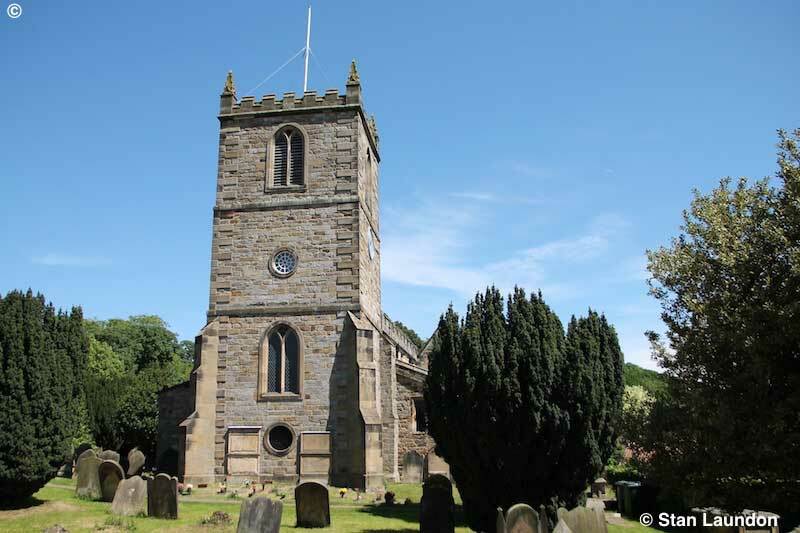 The Church of All Saints in Kirkbymoorside, North Yorkshire, is a Grade II listed building. This rabbit was having a good tuck in when I spotted it near Newburn Bridge Industrial Estate in Mainsforth Terrace. I don't know whether this is a rare species only found on the coast near Hartlepool or was it washed in from a far away place I wonder? When I was out taking a series of photographs of Grade II listed buildings in our area and concentrating, this time, on Hart, thanks to the owners of Hart Windmill I was allowed to access their property to take this shot. 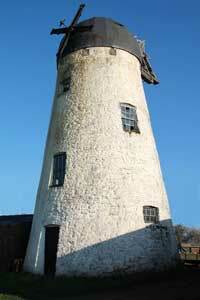 There's more detailed information about it on the Historic England website. The colours projected on St.Hilda's Church during the Wintertide Festival in old Hartlepool were spectacular. There are a few more photographs of this festival on my Night photography page. I spotted this lovely creature on the Fish Quay when I was down there taking photographs of ships. 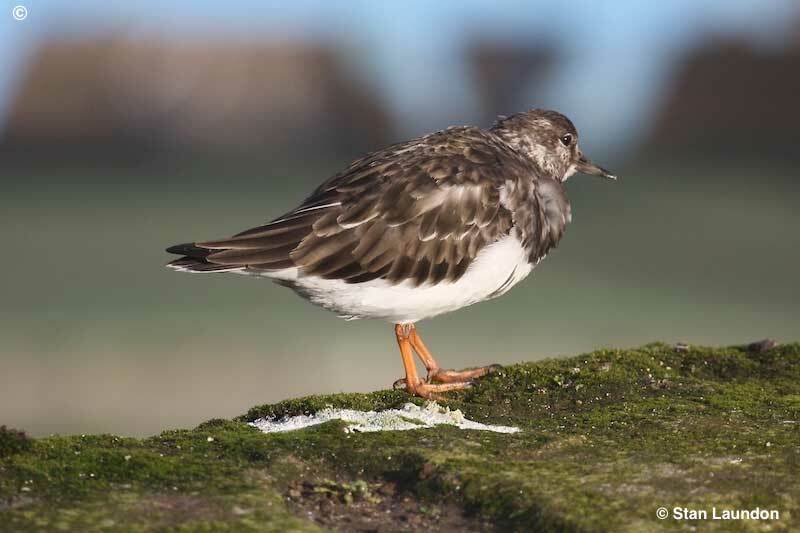 It is a Turnstone. 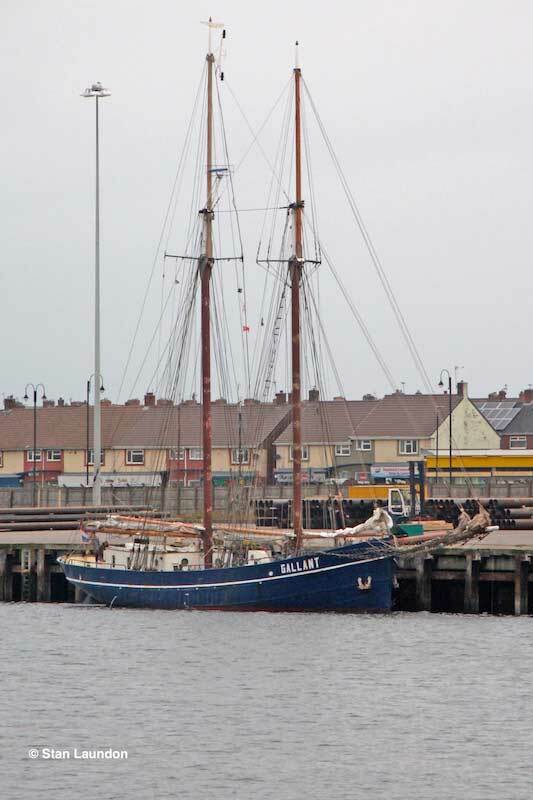 "HMS Pickle" (Schooner Pickle) berthed in Hartlepool marina during August 2016. The Russian Tall Ship "Shtandart" made a surprise visit to Hartlepool during mid August 2016. 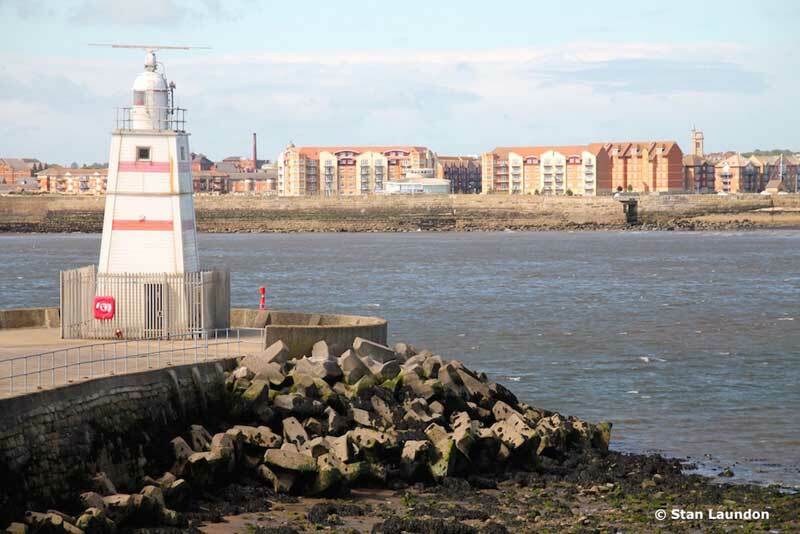 A view of the Heugh Breakwater, or New Pier, in Hartlepool you would not normally see. It was taken on quite a pleasant afternoon during August 2016 and how nice it was to see this image used on the BBC Look North TV weather forecast on Friday, August 12th presented by Jennifer Bartram. 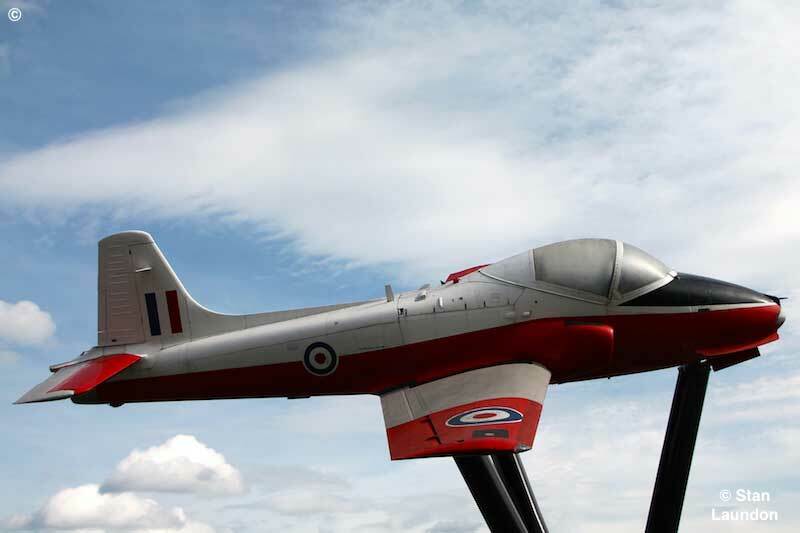 Another view of the ex-RAF Jet Provost in the grounds of Hartlepool College of Further Education. 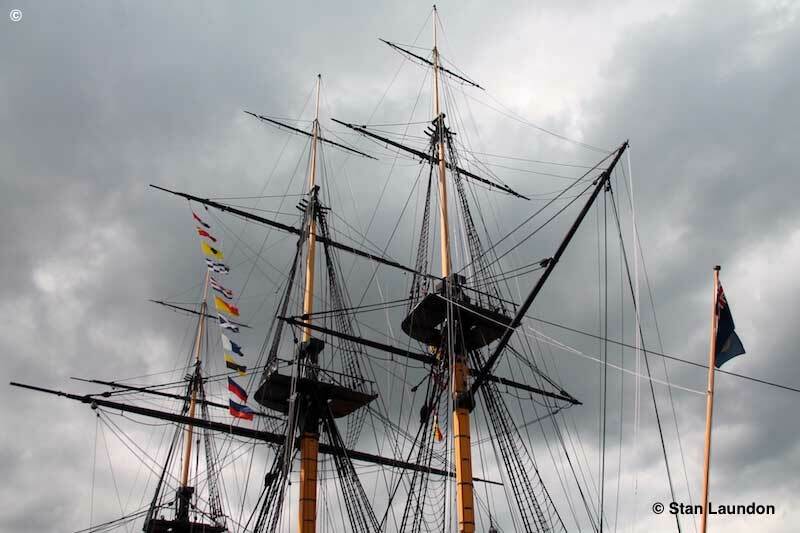 The masts of "HMS Trincomalee" photographed at The National Museum of the Royal Navy in Hartlepool. On the water's edge near the Town Wall was this fine looking Oystercatcher or, as they are called in these parts, a Mussle Cracker! 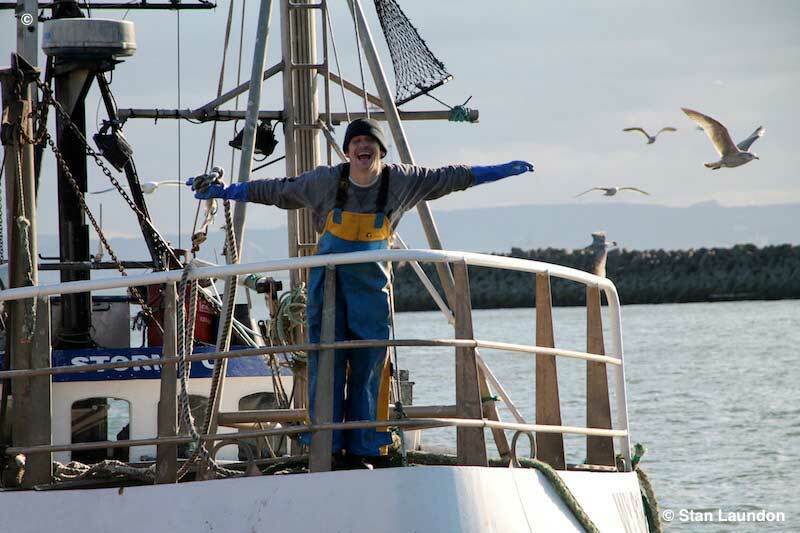 As the fishing boat "Stormy C" came into port I took this photograph of one of the crew as he re-enacted the famous pose from the film "Titanic". I thought it was quite comical so decided to post it here! 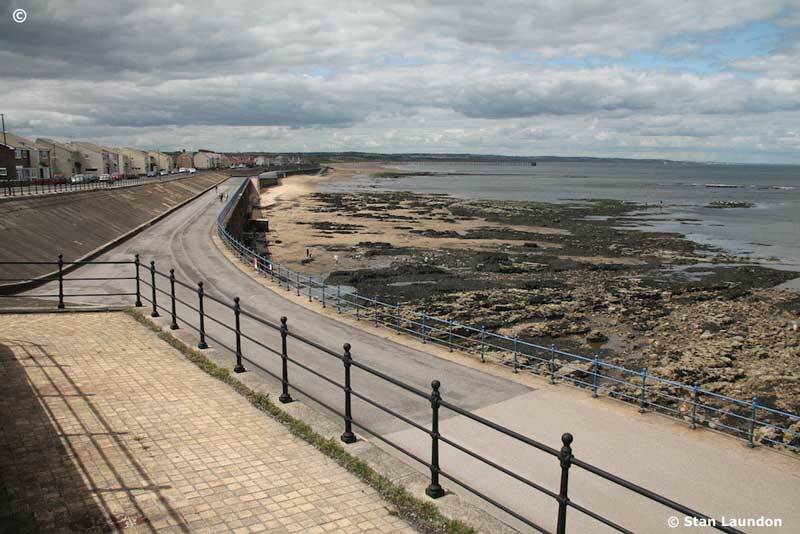 The North Sands and Promenade showing Sea View Terrace and Marine Drive in old Hartlepool. 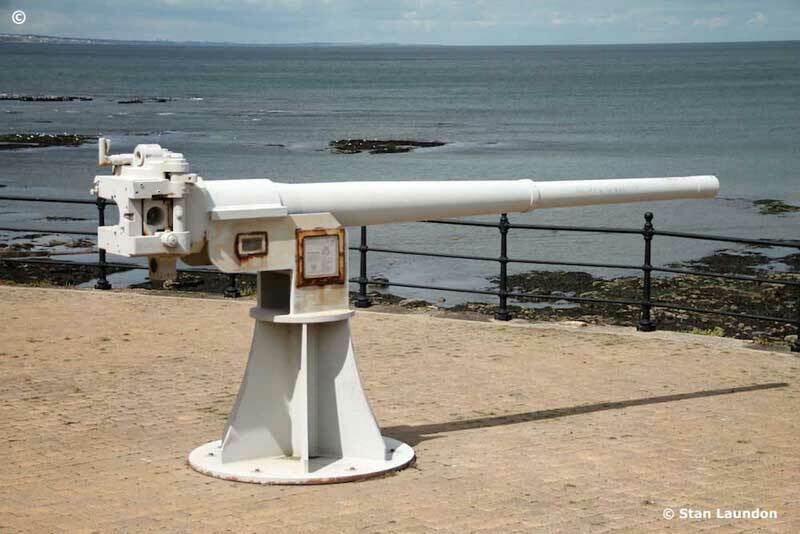 A gun on the site of the old Fairy Cove Battery in old Hartlepool. 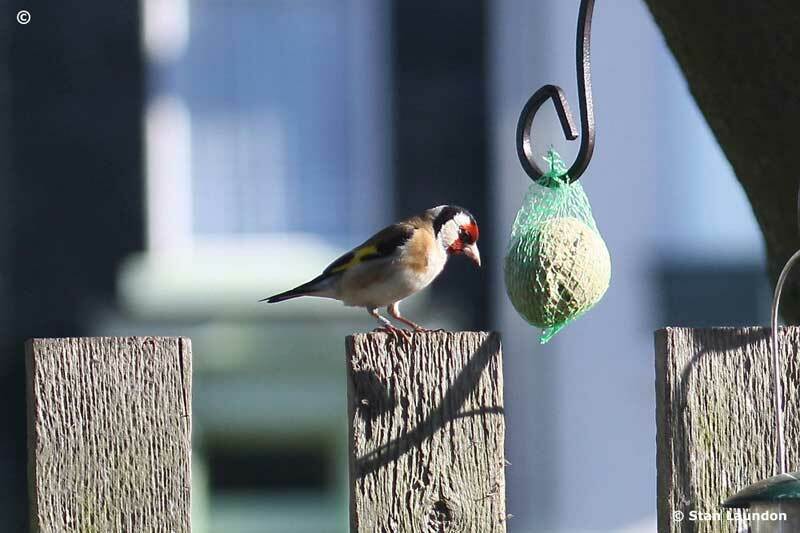 The European goldfinch, or goldfinch, is a small passerine bird in the finch family and was spotted near a bowling green in Hartlepool. A really low tide down at the Pilot's Pier in old Hartlepool. 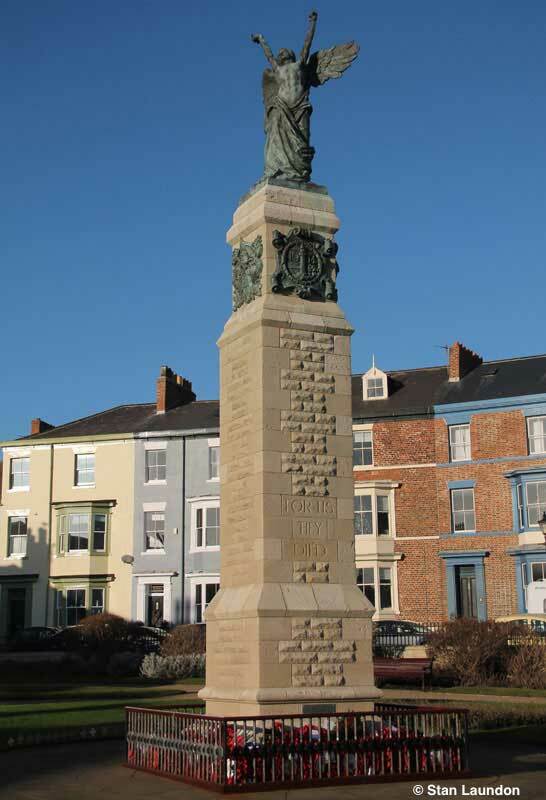 The War Memorial in Redheugh Gardens, Hartlepool. The Brus Wall, standing on the south side of the St. Mary Magdalene Church car park in Hart Village is part of Hart Manor. 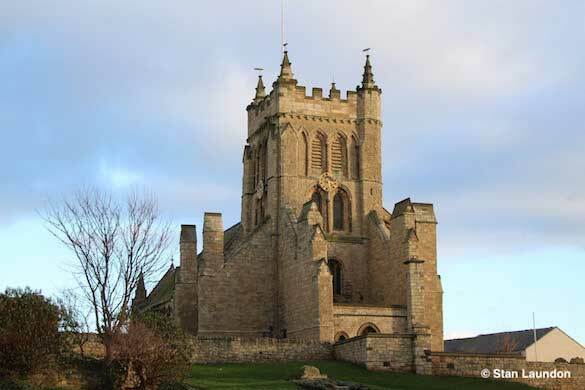 It was one of the less than 250 'Medieval Great Houses' in England. 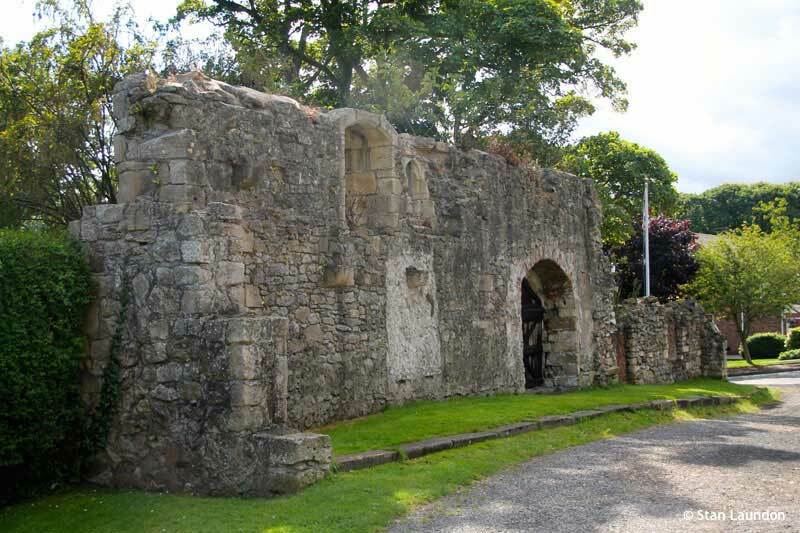 There was a wooden Saxon hall here, replaced by the Norman building, of which the wall was part, said locally to be the birthplace of King Robert the Bruce of Scotland. 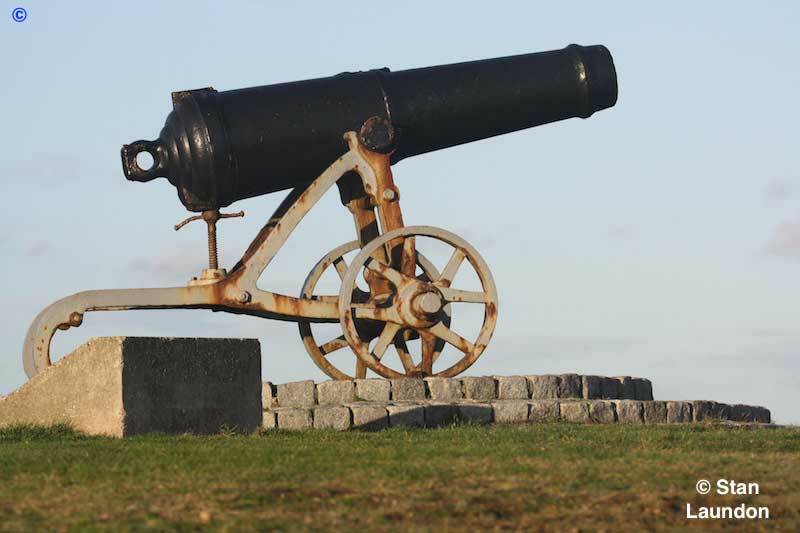 The Sebastopol Cannon near the Heugh Battery and Lighthouse in old Hartlepool. This cannon was captured from the Russian Army at the battle of Sebastopol during the Crimean War (1854-56). 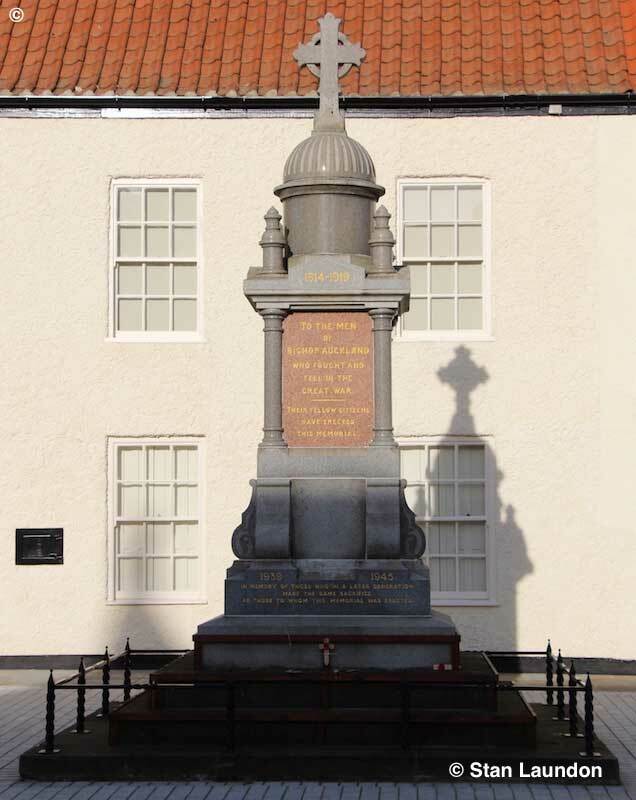 In October 1857, the then Secretary of State, Lord Panmure, offered the cannon to Hartlepool Borough Council who gratefully accepted it. The cannon was transported from London on the steam ship 'Margaret' at a total cost of £2.19s.3d., and, after a year's delay, arrived at Hartlepool in September, 1858. 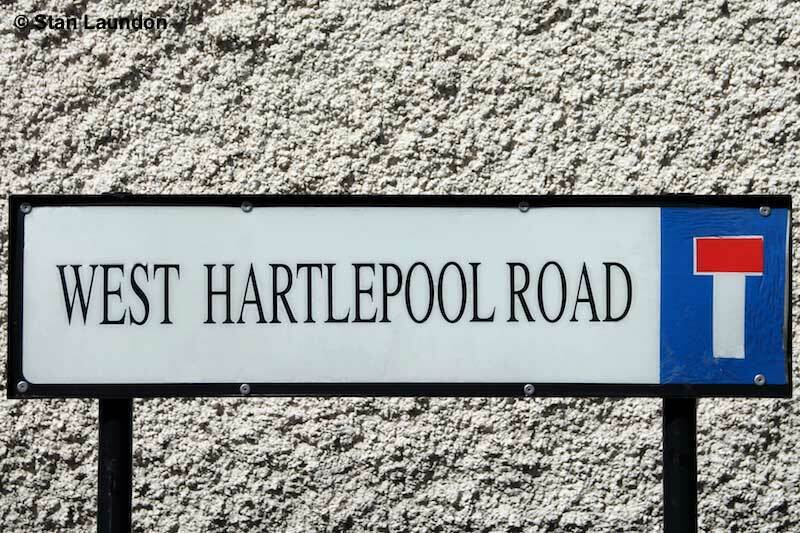 The amalgamation of the towns of Hartlepool and West Hartlepool might well have taken place in 1967 but the signs are still very much there if you look for them - or, in my case this time, find them, as I did by accident in a village not too far away from Hartlepool. Another scenic view of The Hospital of God at Greatham. The church of St. Mary Magdalene in Hart Village. 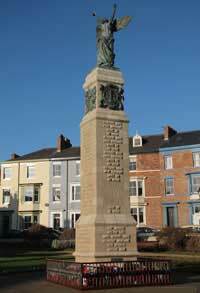 This monument, at the bottom of Church Street in Hartlepool, represents the Millennium celebrations of 2000. This was spotted on the hull of a fishing boat in Hartlepool Fish Quay. No explanation is needed here I don't think! When I came across these rather fit young lads on the Pilot's Pier performing a 'Street Dance' they said I had permission to use the photograph. Please do not attempt to do this unless you know what you are doing! 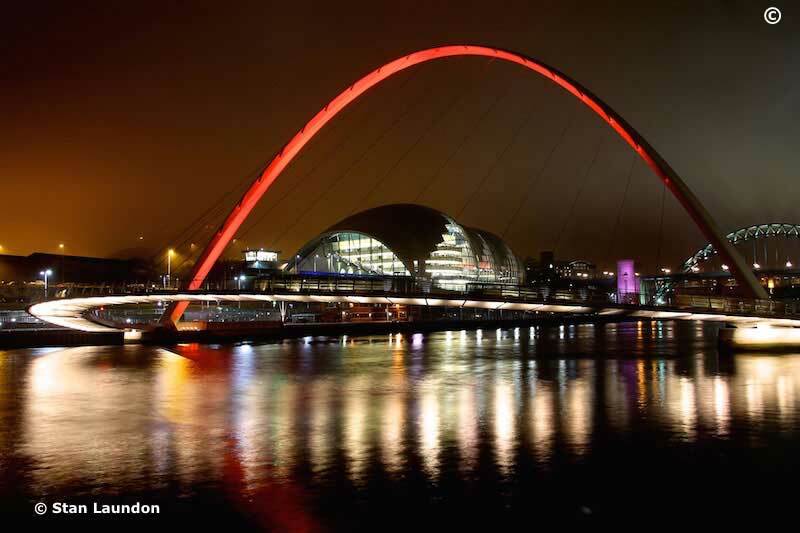 The striking Millennium Bridge spans the River Tyne between Gateshead and Newcastle. I've visited this site a couple of times and always enjoying taking night photographs here. For those who haven't been, the bridge changes colour so you always get nice reflections on the river below if the weather is calm. 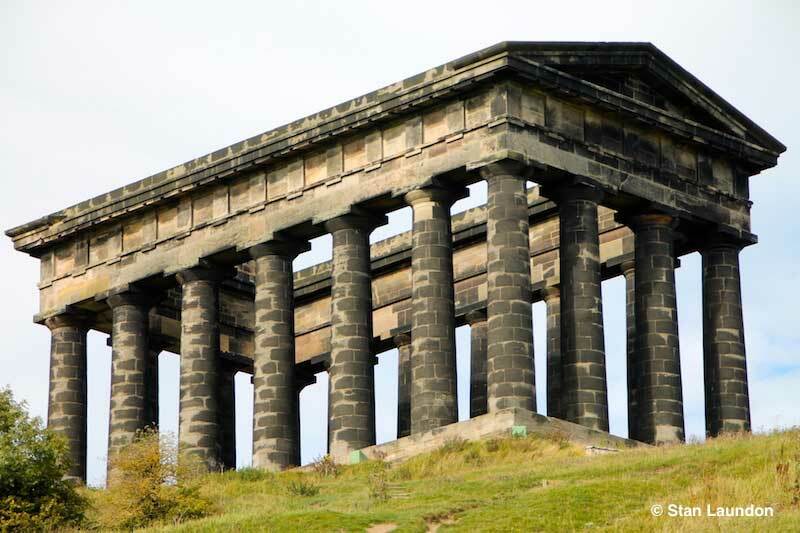 The Grade I listed building Penshaw Monument at Penshaw near Sunderland. 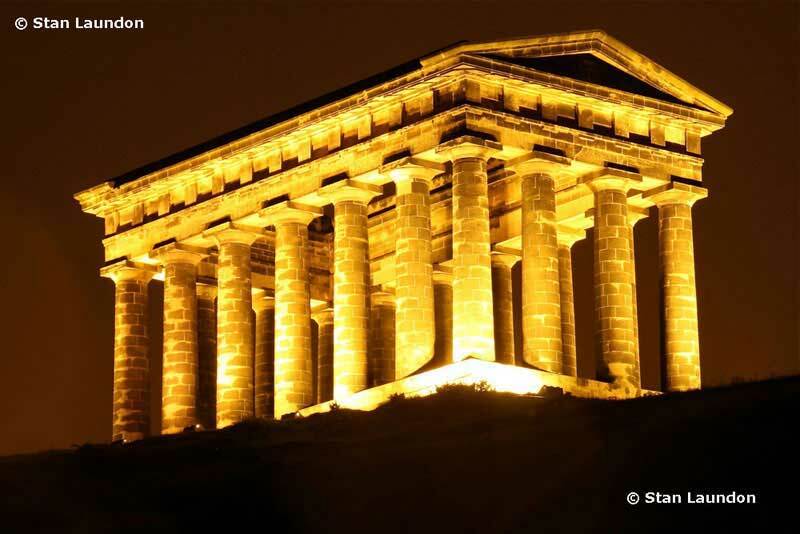 I believe that night time is an ideal time to take a photograph of this 70 foot high folly, which is a replica of the Temple of Hephaestus in Athens. Sunset near the Pilot's Pier looking across to the Marina. 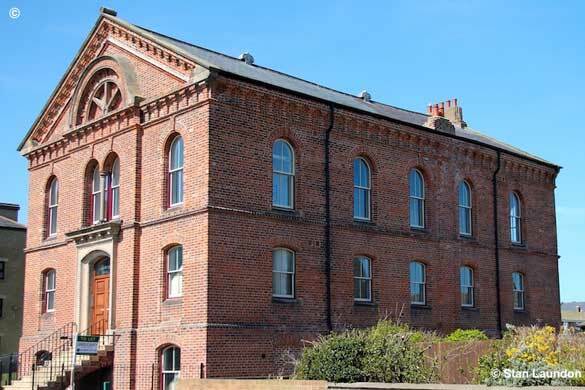 This impressive building in Seaham, County Durham is Grade II listed and was once the old Police Station. It is known these days as Marquess Point and is a residential home. 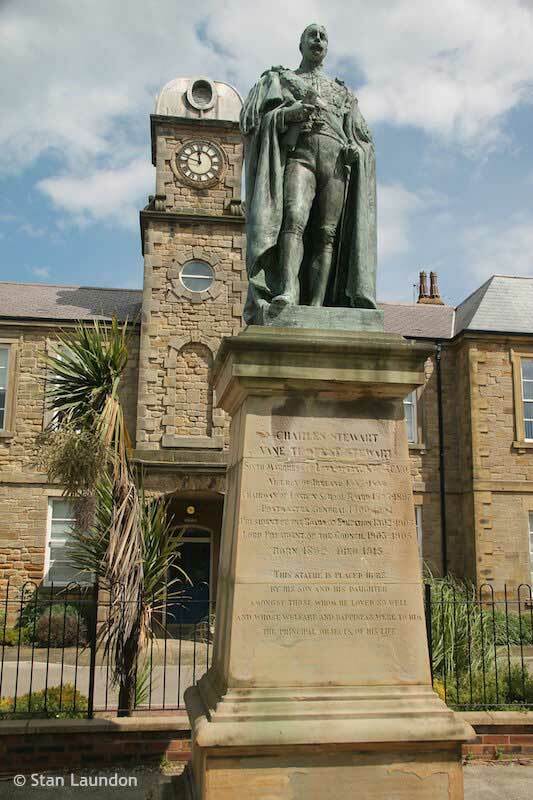 In front of the former Police Station, in Seaham, is this statue of Charles Stewart Vane-Tempest Stewart the 6th Marquess of Londonderry. 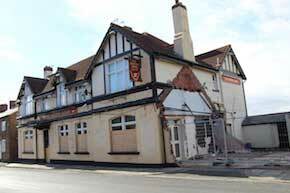 It is also Grade II listed. 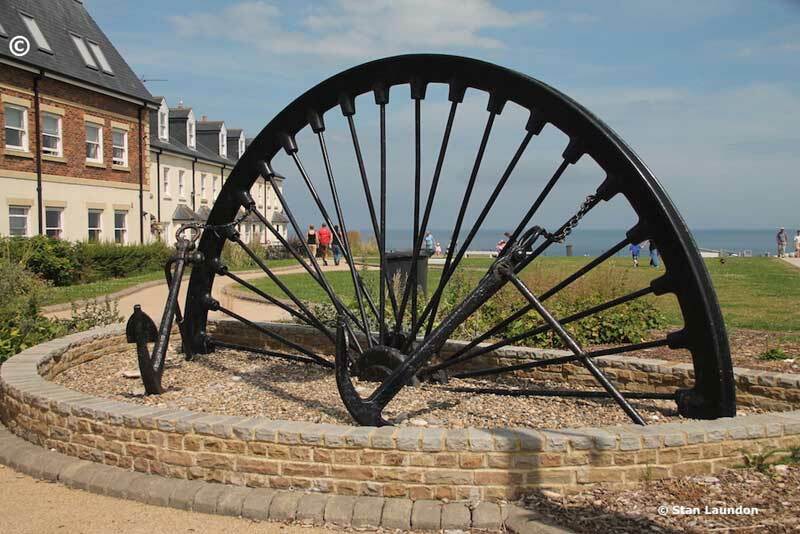 Near the sea front in Seaham is this reminder of the coal mining heritage of the area with a pit winding wheel. Castle Eden Castle in Castle Eden, County Durham. 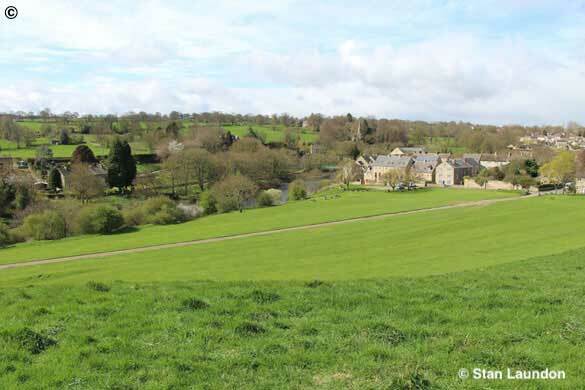 This country house was built around 1765 and is a Grade II Listed. 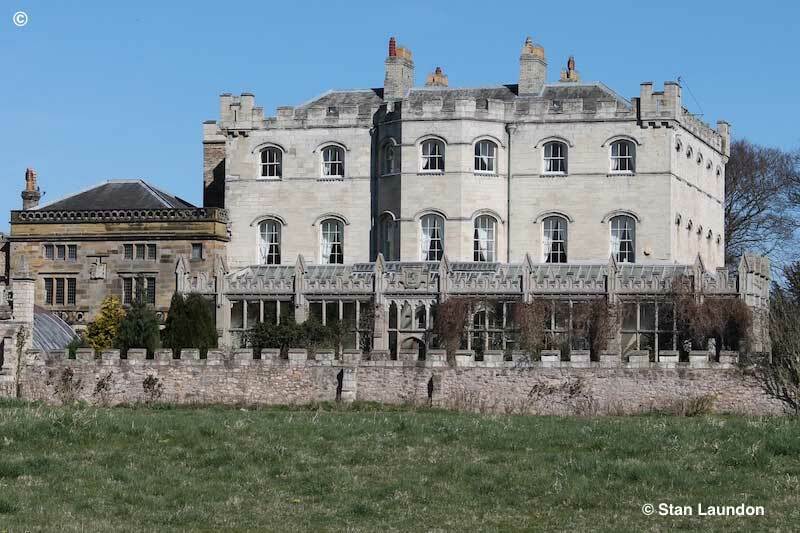 The British Listing Buildings website indicates it might have been changed around 1780 with a later addition to the building in 1863 and again in 1893. Sunset over the River Tees in Stockton with the Infinity Bridge being the main focal point of this photograph. 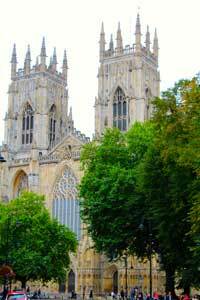 York Minster taken early September, 2018. 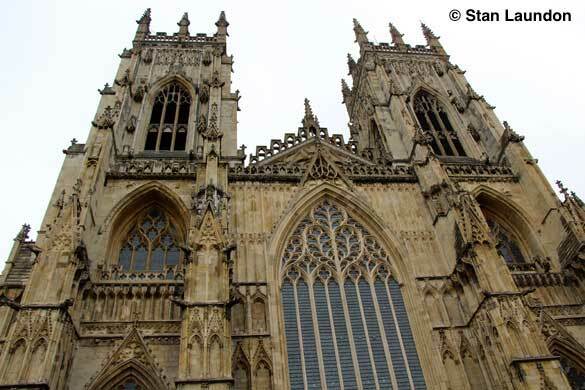 It's not that easy to take photographs of this building as it is so popular with hundreds of people admiring the view. 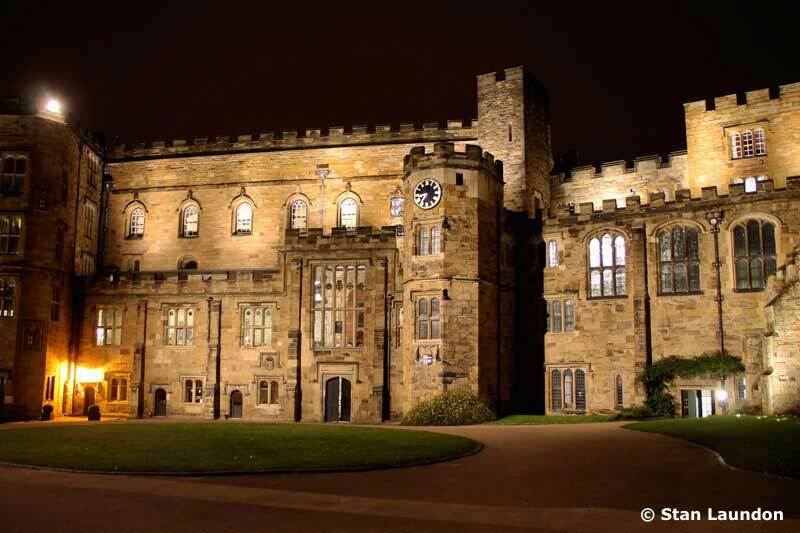 Durham Castle and Cathedral took on impressive new looks in the early part of 2013 with up-to-date lighting installed after the completion of a £600,000 project. Both the cathedral and castle can be seen in a whole new light. 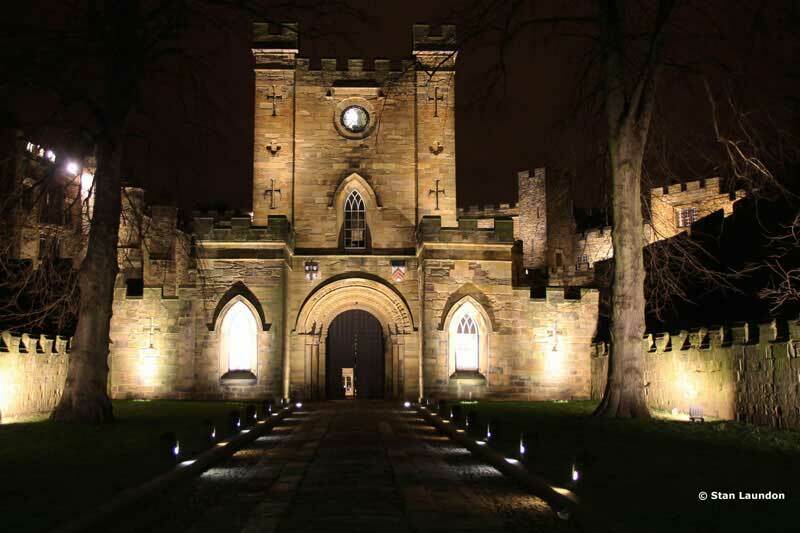 Durham County Council paid for the system which illuminates the buildings which form Durham’s World Heritage Site. Easington Colliery was a former coal mining town in County Durham, in North East England. It is situated to the north of Horden, and a short distance to the east of Easington Village. 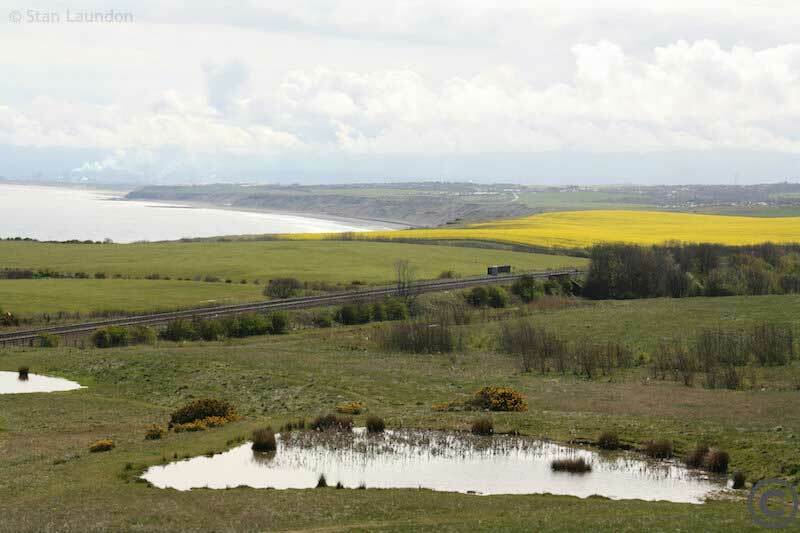 This photograph, looking out into the North Sea, is all that remains of those days of coal in this part of our country. 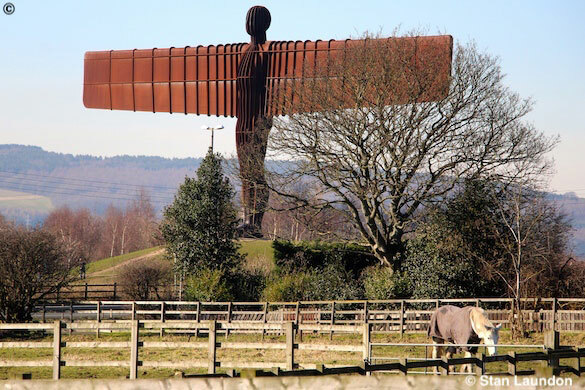 The collieries that once dominated many parts of North East England have now gone and the pit heaps have been reclaimed and naturalised into the landscape, but there is no doubting the important influence that coal mining has had upon shaping the modern character of North East England. 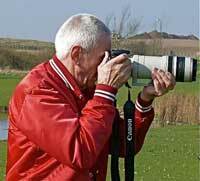 Stan Laundon - Photograph © Larry Drummond.